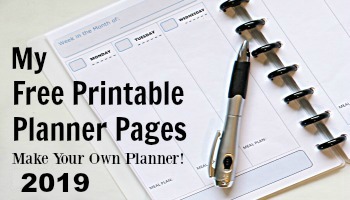 This post was originally published August, 2012 and was updated August, 2018. How do you clean your eyeglasses? With just plain old water? With window cleaner? Or maybe you just breathe on them to steam them up a bit and then grab the corner of your shirt and start rubbing? All of these methods will work to some extent, but you can make your life a little easier (and your glasses a whole lot cleaner!) 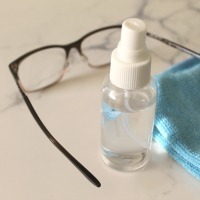 with a bottle of this homemade eyeglass cleaning solution. 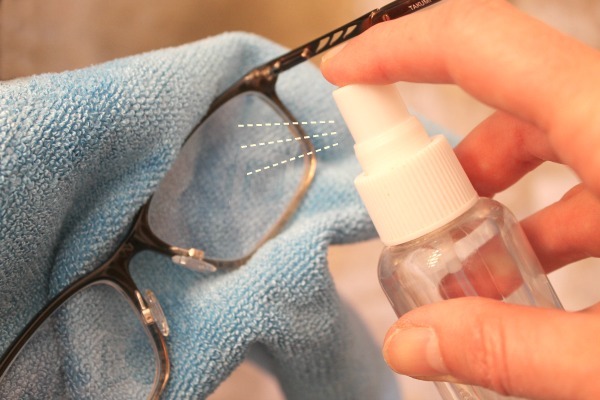 I first decided to make my own eyeglass cleaner several years ago when I had some little spots on my lenses that weren’t coming off with just a quick rinse with water under the faucet. It turned out those spots were the mist from hairspray settling on my glasses. I needed something that would get rid of those stubborn spots and this homemade cleaner did the trick. The method I use to make my own eyeglass cleaner is to use a simple 50/50 mix of water and rubbing alcohol with a tiny squirt of dish soap added in too. I put my mixture in a small 2 oz mist bottle and don’t take the time to measure. I just fill my little bottle half way with rubbing alcohol, fill it the rest of the way with water, and finish up with a tiny squirt of dish soap. I then give it a gentle shake to mix things together and it’s done! You can buy fancy eyeglass cleaners and pay anywhere from $5 to $20 a bottle. 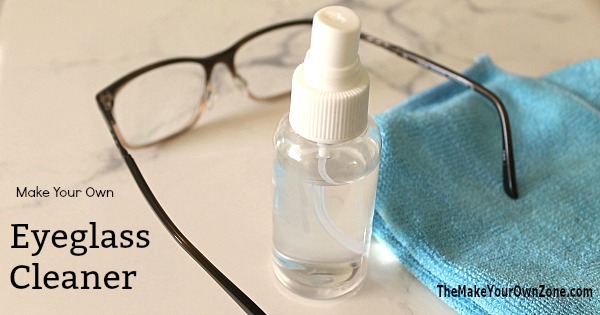 This homemade solution for cleaning eyeglasses can be made for just pennies and is certainly just as effective. There have been some questions about the alcohol in this mixture and if it is safe for lenses. I can only respond with my own personal experience using this mixture and it has not been a problem for me. I have been happily using it for several years and it’s done a fine job with no damage to my lenses. However, I do not have transition lenses or the anti-glare coating on my lenses. Also after about two or three years, I’ve been needing to get my prescription updated and so I don’t keep a pair of eyeglasses much longer than that at this point in my life anyway. If you have concerns about using the alcohol with any of the special type of lenses, you could try using a little less alcohol in the mixture or try leaving the alcohol out and just using a mixture of mildly soapy water in your spray bottle. Interestingly enough, I recently had to purchase a new pair of glasses and they gave me a little complimentary cleaning kit and various papers to take home with me. So I’m reading my papers and there was a note on there not to use alcohol. BUT – then I read the ingredients on the little free bottle of cleaner they gave me and it says “contains alcohol”. So go figure! They were saying one thing, but doing the opposite. No wonder we can’t figure out what to do! Again, I will just say that my experience with this cleaner has been positive. (In fact, I make it in larger batches and use it as a homemade glass and mirror cleaner for around the house too!) For me, the rubbing alcohol gives it the extra boost to really get the glasses clean, especially from the pesky hairspray residue that creates problems for me. It’s been a very simple and frugal way to make a homemade version of the store bought eyeglass cleaners. 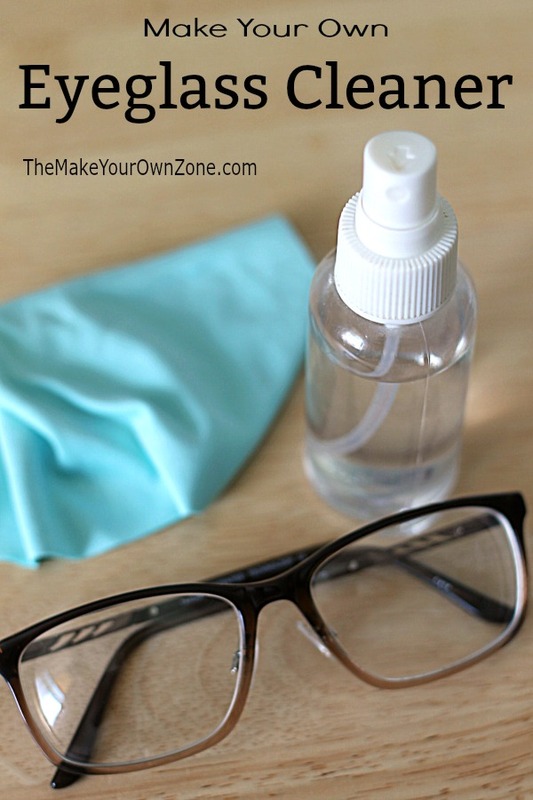 Make your own eyeglass cleaner for pennies with this quick and simple mixture. Add a tiny squirt of dish soap. Put the top on your bottle and give it a gentle shake to combine the ingredients. To use: squirt onto your lens and wipe off with a soft cloth. This recipe can be made in any size by simply using a 50/50 mix of water and rubbing alcohol. Fill your bottle half way with alcohol, then fill it the rest of the way with water, and finish off with a small squirt of dish soap. Thanks for sharing nice natural tips to clean eyeglass. please share another article about eyeglass cleaner. Took the eyeglass cleaner recipe and married it up with the homemade wipe cleaning wipe idea for cleaning glass and mirrors. Also works great for auto glass. Rubbing alcohol is a great disinfectant too! I’m wondering about using distilled water so that it lasts longer and since it’s going to be near my eyes? Distilled water could be used in the mixture if you wish. That sounds like a good mixture too Nicole! I know this isn’t home made, but my optometrist uses spray Pledge (for dusting furniture) to clean the lens of glasses. It works great and resists build up, just as it would on furniture. Weird! I would have never thought of using Pledge on a pair of eyeglasses either! Does it leave an oily residue? I use a similar mixture on my bathtub after bathing and it really seems to cut the oils, etc that stick to the tub sides. It lessens the amount of scrubbing by far. I never thought to use a mixture like this on my bathtub, although my homemade daily shower cleaner does have alcohol in it, and it must be the alcohol that’s doing it. Thanks for sharing your tip! I heard that alcohol with non-reflective coatings was a no-no…. Does this work for antireflective coatings? I remember using straight alcohol on one pair as a friend said it worked great. It fogged up my lenses. So, I am a little skittish. Rita – I was posting the answer above when your comment came through wondering about the same issue. The alcohol is what makes this mixture work well, but if you are worried about the anti-reflective coatings, you can leave the alcohol out and use a little more soap instead, or you can try using less alcohol. Thanks, Beverly. I will probably leave the alcohol out as my glasses cost almost $400.00! Also, I have it checked to be notified when I get a response by email, but I never got one. Is that part working okay? Can it be used on glasses with reflection free coating?? After doing some research, I believe this should be safe on lens with anti-reflective coatings. If you wanted to be a little more cautious, however, instead of doing a 50/50 mixture of alcohol and water you could use less alcohol and more water (perhaps a 30/70 ratio of alcohol to water). 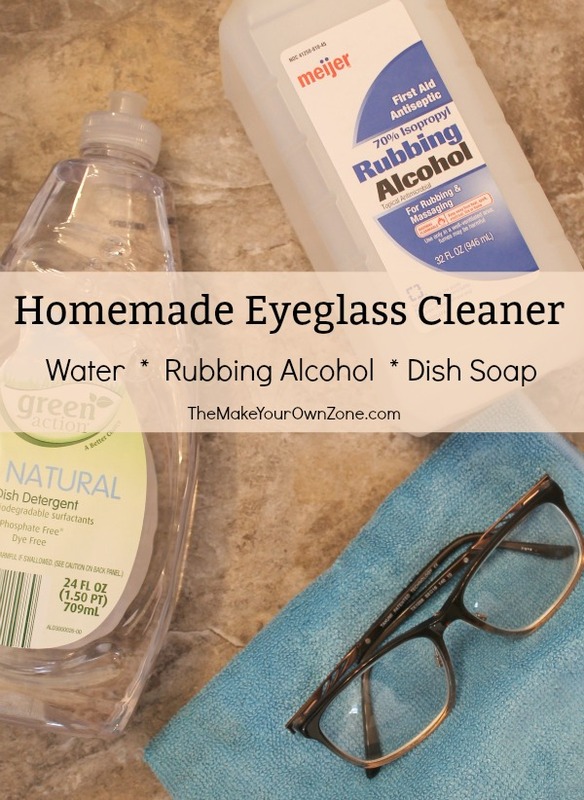 Or you could just use water and use a few more drops of soap for an alcohol free mixture, but the rubbing alcohol is really what makes this eyeglass cleaner work well. Just curious. Does this work for mirrors, too? I have not tried this on my mirrors yet, but I did use it on the inside of my car windows the other day and it worked great! It’s the time of year when the sun is at a really glaring position when I drive to work in the morning and I could see how cloudy my car windows were. I decided to use this cleaner and it did a really good job of cleaning the car windows without leaving any streaking. That makes me think it would probably work well for mirrors too. How do you keep the cleaning cloth sanitary? Well I must confess that I keep this eyeglass cleaner in my bathroom and most of the time after I squirt on the cleaner, I simply use the nearby hand towel to dry my glasses off. As I’m washing my towels on a regular basis I’m never using the same cloth for an extended time for this purpose. The towel seems to be soft enough and does not leave lint on my glasses. However if you do have a soft cloth that you like to use, I would think the rubbing alcohol would be helpful in keeping germs from starting, and most cloths for cleaning your glasses should be machine washable. is it o.k. for transition lens? I am not sure, but if you are concerned about the transition lenses, you can leave the alcohol out and add just a bit more soap.